We have seen that a flag halves the value of a quarter note, and a double flag halves it again to a quarter of a quarter note. More flags are added to reduce the duration of the note, by a further half for each flag added. In printed music scores, if you have a long series of these shorter notes, it becomes difficult to know just how many there are, because our eyes and brain have to assimilate that information. Because we are busy playing the music, and as multi-tasking (which we are already doing with 3 keyboards, and many other buttons to operate, etc.,) is not everybody's forte, we need a simpler way to depict them. The common practice is to use Beams. For these first 2 measures, (that is the section you see between the vertical lines), are equal in value, but the third section is in fact only half a measure. The double flags on the notes in the 3rd measure, make these half the value of those in the 2nd measure. So the notes in measure 1 total a count of 4, as does measure 2, while measure 3 has only a count of 2, and is therefore incomplete, musically. What I want you to notice, is how you can see that the beams (those solid black horizontal lines joining those shorter notes together) are much easier to 'read', when the notes are placed in groups as in the lower clef. But what happens when there isn't a note taking up each beat? That's easy, we take a Rest. A rest is just like a note, in that it shows us how long it should be, but of course it is silent. My grandfather used to tell me that music is a series of sounds and silence. In a very basic form he was right, but it is so much more. Therefore learning to read music greatly enhances our appreciation and interpretation of it. The length of the rest is determined by its shape or unique character. 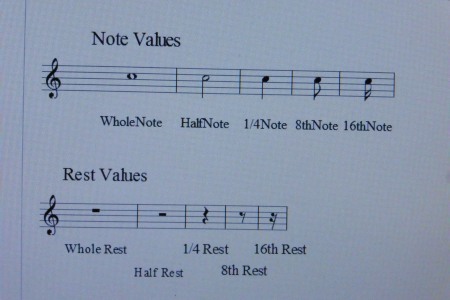 Here is a picture showing the common Note Values and their corresponding Rest Values. These are self explanatory and need no further detail from me, but notice how the flag idea for the Notes is carried over to the Flags, in a related fashion. Just as more flags added to notes reduces their duration, so similar 'flags' are added to Rests to reduce their duration. 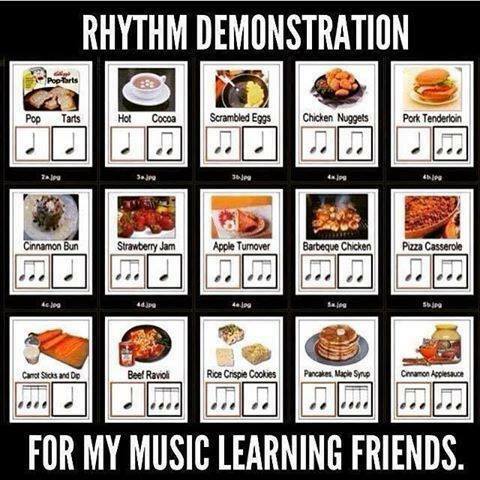 Just as you did with the different notes, you have to learn to recognise these and become very familiar with them. In the next Reply we look at different ways to lengthen a note. A dot after any note, adds another half of that note's value, or duration, to it. e.g. A dotted Half Note would equal a Half Note + Quarter Note for its total duration. Equally a dotted Quarter Note would equal a Quarter Note + Eighth Note for its total duration. A second method to extend a note's length is to use a Tie, which you will see in the second line of music in the picture above. These are used to extend a note into the next measure, or measures. You can make these notes as long as you like, covering several measures. I will explain measures in subsequent Replies. So 2 or more notes Tied Together should be held for as long as the value of each of those notes together. They should be played as if they are one long note and not sounded individually. Don't forget that ties are commonly used to signify held notes that cross measures .... which are normally called Bars. 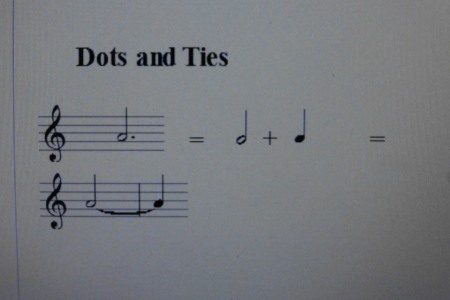 It is legitimate to use dotted notes with ties, of course, should the need arise. In the next Reply we look at two important extra areas. The Beat and Meter, which is what you tap your foot to, or clap along with, when listening to many songs. The Measures that we conveniently divide music into are often called Bars. To help you with the meter or beat, here is a clever but nevertheless very helpful guide to getting the timing right for all those new notes that you are learning. It is a bit of fun, too, but it may just make you feel hungry. If your screen doesn't enable you to read them all, please post a request below for clarification and I will oblige. In order to play any music, you need to know its Beat or Meter. This is what you use to clap to a specific tune, or tap your foot to, etc. In musical scores the meter is presented in a similar fashion to a fraction, (Remember fractions?) it has a top number and a bottom number. 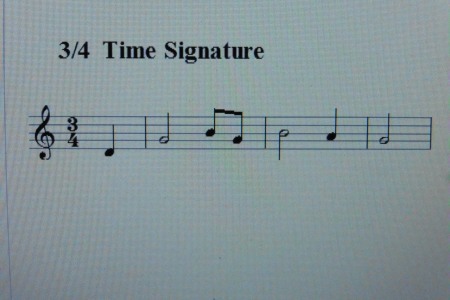 This is called the Time Signature. You will see that immediately after the Treble Clef, there is a 4 on top of a 4. The top number tells us how many beats there are in each measure. A measure is that section of the staff between each vertical line. These are normally called Bars and the vertical lines are referred to as Bar Lines. The bottom number tells us the note vale for a single beat - you remember, the pulse your foot taps at, while listening to the music. So in the example above, namely 4/4 it means there are 4 beats per bar and that every quarter note gets one beat. Notice that there are not 4 notes in every bar (yes I know there are only 2 bars). There are 4 BEATS in every bar. The second bar has 2 quarter notes and 1 half note, so counting the beat, even just in your mind is crucial to getting the rhythm right. Try counting along with the 4/4 example, 1, 2, 3, 4. You may be able to recognise the tune. If you can't, your grandchildren will help you! Sorry, No prizes for getting it right. In the next Reply we'll look at a different Time Signature. Being able to 'count' the beats as you are listening to a tune is very important, as this will keep you on the straight and narrow when you subsequently play the tune. How often have we heard, "He/she has no sense of rhythm", meaning that the timing of the piece is straying all over the place making it almost impossible to listen to. But there are some pieces where the composer has deliberately strayed from keeping a strict beat/meter. With the AR, if we use a Rhythm Accompaniment we are restricted to the beat/meter as 'programmed' in the AR .. unless one uses the SEQUENCER to program in a Rhythm as it was originally created by the composer. One such example is All You Need Is Love, by the Beatles. Listen to the recording I made of this song, and count 1, 2, 3, 4 as the song progresses. You get the 'first beat of the bar' in the right place right through the piece. Or in other words, I have 're-arranged' the piece to fit the Rhythm Style of the AR. Now click on the below. 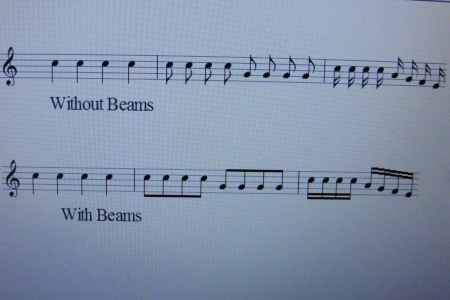 This is how the piece should be played, as this is how it was originally written by the Beatles. You even get a "Counting 1, 2, 3, 4" before the piece starts. When they start playing the main tune, try counting your 1, 2, 3, 4 .. and continue through to the end. You will come unstuck before you even reach the end of the second bar. And each time you try to re-start counting the 1, 2, 3, 4 it's not long before it's all haywire again. This is what makes this piece so difficult to play! And here's another one where 'counting the beats' is so important. Charlie Brown. This is what I have played, 'by ear'. Again, count your 1, 2, 3, 4. Now click on the below. This is the tune as sung by the original artiste, Sylvia. This is a 45rpm record I had, which I have uploaded to YouTube. Again, count the 1, 2, 3, 4. The tune does eventually fit into this meter, but I had the emphasis of each first beat of the bar completely up the spout. So I shall have to try recording it again, putting the emphasis in the right places (and changing the Rhythm to something more suitable). Perhaps it's 'breaking the rules' that make some pieces of music so interesting. NB: 'Adverts' may appear on my video. Also, this video is not available for viewing on either Mobiles or Tablets .. but OK to view on Laptops and Desktops. It is also not available for viewing in Germany (where the original recording was made). Apart from these restrictions, YouTube are happy to host my video. They say the restrictions are for Copyright reasons. This also reveals something else that we will often come across, and we need to be aware of it. First this is designated 3/4 Time. (Bottom Number) that every quarter note gets one beat. Notice again that there are not necessarily 3 notes in every bar, but every bar must have 3 BEATS. I have used this particular example to draw your attention to another couple of very important facts. We have already realised that every bar must contain the same number of beats for that time signature. These can be made up of notes and/or rests. Each bar must be complete and have its full count of beats, which may be different value notes or rests. It is also common for the First beat of the bar to be dominant or carry an emphasis. If you recognise this tune and sing it from note one, you will realise that the emphasis is on the second note, then the fifth note and every third beat after that. To achieve that emphasis the composer adds a bar line after the first note, then in line with the Time Signature, every third beat after that. This is a simple way to maintain the emphasis on the first note of each bar, where the composer wishes it to come in the melody line. As a result, when you get to the very end, the last partial bar will contain the residue of what was in that very first (in this case - one note) bar. the first and last partial bars add up together to a total of 3 beats. This is very common, so it is important to understand what is happening, and why. In music you must obey the 'mathematical' rules at all times. 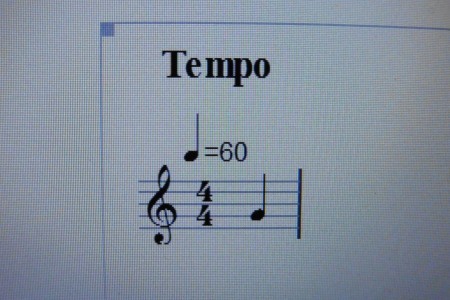 One further issue, is to realise that the Time Signature may change at certain points midway through the music score. 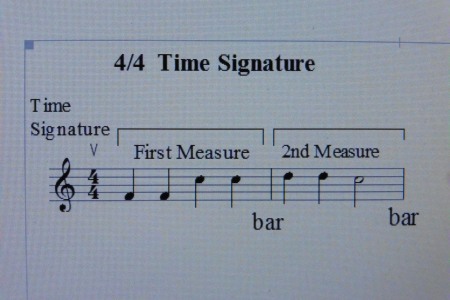 The composer simply puts a new Time Signature on the staff, but it will always be at the Beginning of a Bar. In the next Reply we look at Tempo. In addition to your note values and time signature, the last ingredient to feeling the rhythm is the Tempo, which simply means the beats per minute. Often there is no guide like this and you have to select your own speed. Occasionally there may be a written instruction, like With Energy or Slowly and with feeling. You make of these what you will. In the above example you should play 60 of the specified notes (in this case quarter notes) for every minute. Obviously this is playing each of those quarter notes at the rate of one per second. Musicians use an instrument called a metronome to help them keep the correct tempo, when practising a new piece of music. If you use the rhythm facility on your AR, you can set the tempo to the recommended value. Note if you select a suitable rhythm (don't use a Waltz for a piece in 4/4 time) and by turning all the sound values to zero, you can use the pulse like a metronome, with the flashing red light marking the first beat of the bar. The next thing we need to look at is the Scales. You will notice that this scale begins with the Key Name's Note which in this case is C and also ends with another C. This second C is 8 notes above the first one and that interval is called an Octave. Every interval on the keyboard between 2 notes of the same name is also called an Octave. The C Scale is very important and therefore you need to practice it and become very familiar with it, because by knowing this, all the other major scales will start to fall into place for you. Now each of these notes on the staff corresponds to a note on the keyboard. It is called Middle C because that is the note found in the centre of a piano keyboard. You can find this note on a piano by picking out the C nearest to the lock, (If your piano has one - most do). On your AR, this first C is the one in the centre of your Upper Keyboard, and is the same C as the one immediately below it on your Lower Keyboard. So on the Upper Keyboard you have 2 Octaves either side of this C, but on the Lower Keyboard you have 3 Octaves to the left of it, and 1 to the right. Now let us relate the notes on the staff to the notes on your AR. You will notice that in both cases the notes ascend and move to the right on both the staff and your keyboard, so that the pitch gets higher. You need to become very familiar with reading the note on the score and recognising which note that is on your AR. At first this may be tricky and initially you may find yourself counting the lines or spaces on the staff, by chanting "Every Good Boy Deserves Figs", but very quickly, it will become second nature. Remember when you read, you do not consciously look at every individual letter but rapidly assimilate the whole word, or even phrase, before moving on to the next line. This will be true for your 'reading music' as well. But what about those Black Notes on your keyboard? Well, we will look at that in my next Reply. Your statement above must surely be the essence of reading music ..
.. and this has been the problem with my not being able to read music. I used to sing bass in a church choir so would count the lines/spaces on the music and work from 'intervals'. And anyway, I seemed to know intuitively what was the next note to sing; just wanted confirmation from the music score as to whether it was 'up' or 'down', and whether it was a 'small jump' or a 'big jump'. Never would I chant 'Every Good Boy Deserves Fruit' (actually, as it was the bass part it would have been 'Good Boys Deserve Fruit Always') as the names of the notes would be meaningless. It was more applying Doh, Ray, Me, Fah, Soh, Lah, Te, Doh as the names of the notes one was singing (like the children in The Sound Of Music). .. so I quickly learnt how a C chord was formed; a D7 chord etc. and I can read these off the sheet music no problem, so long as the sheet music has the chords written as letters. Music with no lettered chords written on it is a no-no for me. I used to play hymns at assembly at the school where I taught, but first had to write the chords in letters over the top of the music score in my hymn book. I think the best way for me to learn how to transfer the notes on the music score to actual notes on my AR is to print out all your PDF 'examples' from your Let's Try Composing series and play them from the written music score. These are all one note melodies and are just the white notes, so with practice I should find that it becomes second nature to be able to do this. Mind you, I have been trying to read music for 60 years and have never succeeded. I even had a music teacher come and give me lessons on reading music, but he didn't succeed either. We kept getting sidetracked on the technique of how to play something. I even went to watch him playing a keyboard at a local pub .. but he never had any music up in front of him. When I asked him about this, he said, "Why would I want to do that? I would be playing somebody else's arrangement of a piece. I play everything just the way I want to hear it." And when I asked him why he was coming up to me to teach me how to read music, he said, "Because you asked me to." I must confess, I did get a lot out of watching him play. Another comment about 'reading music'. If you told me to play a D7 chord, I would play that instantly (one of the inversions, anyway). If I saw the notes D, F#, A and C as 'notes' written on the stave there is no way I would be able to tell you that that was a D7 chord. Busker music with just a melody line and letter chords will be fine for me once I can read that melody line from the sheet music. I learned to read music by playing the recorder at school, and though I could never play a key board until I was in my mid 50's, I could 'sight' read, and harmonise, so used to sing tenor......and still do but a little more croakily nowadays. I've done that for so long, that now I find it more natural to sing a harmony than the actual tune. For learning to read music, there is no short cut, other than patiently linking the music score and the notes on the keyboard. Take a close look at the last 2 pictures in the previous reply (the Scale of C in the music score, and the notes in the octave on the keyboard) and marry those 2 things together. Play the scale, recognising the notes on the keyboard, while looking at the notes on the music score. Vary going up and down the scale, then pick out notes at random, relating them together. With persistent patience it will come, and you will master it. We are never too old to learn.....they say! What about those Black Notes, then? Musically if we just had whole steps between each note letter, it would severely limit the melodies we could produce on our instruments. The distance between C and D on the keyboard is a Whole Step. These two notes have a Black Note between them. Similarly, the distance between D and E is a Whole Step. However the distance between E and F is a Half Step, because they have no Black Note between them. There are many other types of scale, each with a unique pattern, and although in time you'll need to discover, at least, the minor scales, we are going to concentrate on the Major Scale for the moment. To understand this fully, in the next Reply we look at Key Signatures and in the following Reply we consider accidental half steps. I thought it might be helpful to step back a little and take a look at the keyboard layout. The advice is then given to sit at your instrument so that the centre line of your body lines up with Middle C.
I have discovered (it wasn't difficult) that with many modern keyboards this is not the case. Most have more notes above Middle C than below it, so to play it well you actually have to sit to one side of the centre. Because of the marvels of modern electronics, they have effectively sawn off the left hand part of the keyboard, and generated those really deep notes by some clever wizardry, so as to make the keyboard more portable. Again this is obvious, but all the notes to the right of Middle C gradually increase in pitch, in other words they sound higher up the scale, whereas those to the left sound lower in pitch. In music as the notes ascend the stave, they go up in pitch, and vice versa. 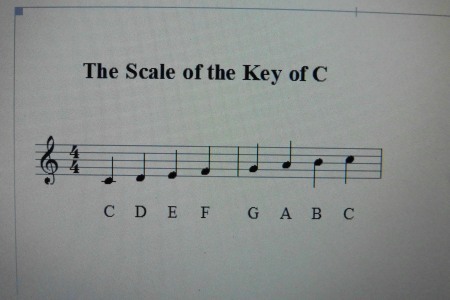 All this helps you, as you learn to read music to appreciate that scores are logically laid out, as is your keyboard. Now imagine if there were no black notes on your keyboard (pedalboard). You would have no idea where you were, other than by trial and error. You will notice that the black notes occur in sets of 2 and 3 alternating as you progress along the keyboard. Before written music was invented, people copied a tune by ear. They heard it, generally sung by someone else, and then sung it to themselves committing it to memory. Surprisingly, most of us can actually still do that, though I admit some are better at it than others. Once musical instruments were invented, it wasn't so straightforward. Because, although we can find a note with our voices fairly easily (there are a few exceptions), we do have trouble finding them on a keyboard or piano. If you try this with a recorder, flute or violin, it really becomes an even bigger challenge. However, if someone tells you the starting note, you can make a good go of it, but it is still more difficult than simply singing it. That is why, notes had to be given names, and 'they', we don't know who, chose the first 7 letters of the alphabet, A to G. 7 because there are only 7 different white notes available, and they repeat themselves. You make ask the obvious question, if the alphabet begins with A, why on a keyboard do we start with C? I haven't the foggiest idea and as far as I know, neither does anyone else. The good news is that we don't have to memorise every note on the organ. That is because once you have understood the layout of the first seven white notes, they simply repeat themselves all over the keyboards. Keyboards don't always start on C, of course. The compass of keyboards on all sorts of instruments has varied widely over many hundreds of years. The current standard for a piano is 88 keys, starting on A but they started with a smaller compass than that. And from the 1960s onwards we saw 'mini pianos' with 76 note compasses, and here there was often no established standard. Organs? Well, I've played church organs that have had unusual compass keyboards, starting and ending, it would seem, on the whim of the pipe organ builder. On electronics, spinet organs always used to have 44 note manuals from F to C, 49 note manuals on the higher end instruments came in a little later. The 'standard' modern organ compass on a console organ is 61 keys, from C to C, with pedalboards starting on C and covering usually 32 or 25 notes. Harpsichords are a law unto themselves but many seem to follow the organ's 61 note convention today. As for electronic keyboards, they developed from the electronic organ in 1980, and it wasn't long before the 61 key 'rule' came into force, but for some years there were 44 note and 49 note instruments. As for synths, anything goes! For most pro instruments, it's that 61 or 76 notes again, with options for a piano type 88 on the largest. But why start on C? Simply because that's the key that has no sharps or flats in its key signature, I'd say! Same reason why we start to learn with Middle C and pieces in that key. Thank you, Andrew, for your helpful and knowledgable comments. When I wrote the above Reply, I was thinking more about why we start the first scale, or play the music score, by starting on the note C, rather than A. The first thing most folk learn is the key of C, whether on the keyboard, or reading/writing it on the treble clef score. (As opposed to starting on A.) As you rightly say, probably because the key of C has no sharps or flats. I suppose I was trying to be too clever, thinking that people new to music, would automatically think we should always start everything, with the first letter of the alphabet, to keep things logical.